I love soup, and I might be able to eat it 24/7/365! 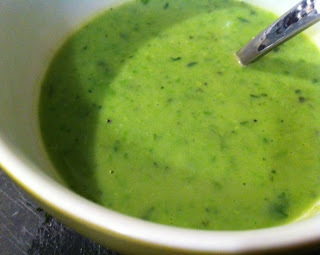 Usually, when I think of pea soup I think of heavy, chilly weather worthy split pea soup. I will be first to say, I love split pea soup as much as the next person, but Atlanta, in the summer, isn't the time to have rib-sticking split pea soup, so I thought it would be fun to have a lighter version for summer. The first thing Z said when she sat down for dinner, "it's green." You betcha' it's green, it's full of peas and fresh herbs! I will admit, I used frozen peas. Because while I am all for shelling peas and using super fresh ingredients, I just didn't have the time. If you do, great, if not, frozen peas will be just as delightful. This is a pretty simple and quick dinner to put together, and I am already looking forward to having leftovers tomorrow. You may be scared to use so much mint and cilantro, but don't. Trust me, it will not taste like candy cane soup. The herbs help create the summery, refreshing feel of the soup. If you do not have mint or cilantro on hand, you can be creative and use basil, or whatever you are feeling like at the moment. This recipe can also be easily be converted to vegan, just omit the step with the cream. The potatoes will thicken the soup enough without it. Return the soup to your soup pot. Stir in the cream/sour cream/yogurt if you are using. May be served very warm, or can sit for a bit and served at room temperature. I served this soup with Parmesan Parsnip Fries.